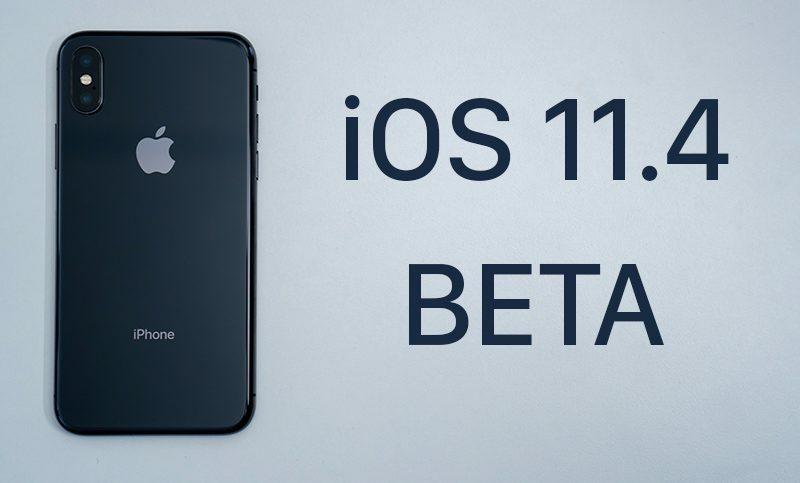 Apple today seeded the fifth beta of an upcoming iOS 11.4 update to developers, one week after seeding the fourth beta and more than a month after releasing iOS 11.3, a major update that introduced several new features. Update: Apple has also released a new version of iOS 11.4 for public beta testers. ClassKit sounds cool. I wish I were growing up today with notebooks and tablets with all of this new software. I still like the analog nature of pen and paper as well as chalk and a chalkboard, but kids today are having classroom experiences that we could only have dreamed about. School computer use when I was growing up was limited to playing the Oregon Trail on Apple IIe's and Carmen Sandiego and Flight Sim on a couple of early '90s Performas my school had. I remember installing all of the ID and 3D Realms shareware available on PCs in middle school. Duke Nukem 3D, Shadow Warrior, Blood, good times! Shoot... only 1.5GB available on my iPhone 6 16GB, and the update needs 2.35GB. I would have to delete a bunch of apps to make space and redownload. Tried the iTunes route but since it’s beta, 11.4b5 doesn’t appear. Does anyone have any helpful suggestions? Or am I going to have to delete to high heaven? I feel for you. 16 GB was enough back in the 3G days but not by 2014 and definitely not in 2018! My only current 16 GB device is my iPad Air. Even my ATV has more storage! I'm limited to only having some essential apps, photo stream and iTunes match to make room for the cool Swift Playgrounds which takes up the largest percentage of storage. I bought it for $300 sealed right before the iPad Air 2 was released. I couldn't pass up on that price even knowing that the lack of more storage would limit my enjoyment. Gee. I'm still on iOS10. Too many little programs I use haven't made the jump. Red Alert is one of the best games of all time along with Diablo 1 and Starcraft! It's ridiculous how many great games were made in the '90s. They're so good that even though the graphics are old that doesn't stop them from being fun. I definitely agree as far as iOS. When I first used it and the App Store back in 2008, it was really amazing. Everyone who saw my iPhone 3G couldn't believe everything it did compared to their Blackberrys and other regular phones. Today, I barely even look for new apps. The main apps haven't really changed and there is no real reason to want to get a new phone until it can no longer run the latest version of iOS well. Right now that's happening for the devices that have 1 GB RAM. iOS 11 really needs 2 GB to run well and I imagine it will only get worse with iOS 12. Back in the old days when computing device capability is highly limited, to sell their software, developers need to work extra hard to squeeze out the best potential of their apps, polish them, test them to its full extent before selling so that apps are in its best state. Story lines, plots, ideas, everything current developers do not want to polish too much, developers at 1980s do. Now, thanks to internet, developers can release their app, and fix the bug later cause reinstalling or updating an app becomes just so easy. Same for the iOS. Same for Microsoft Windows, and macOS. Not sure if such sloppiness is good or bad but definitely not better than the old days when considering the efforts developers put on polishing their products. Happy with the progress, iOS 11 has been great for me since the early betas. Not sure I'll jump on iOS 12 until the final release though. My first computer was an IBM clone with an orange monochrome screen. A hand my down from my cousin in '93. I learned how to use DOS and the command line with it. While I was limited to using Lotus 123 and some basic text editor, it helped me learn how filesystems work which was great before I got my first real PC, a Pentium 75Mhz, 8 MB RAM Windows '95 PC that cost about $1800 in '95. I must say that while using them today would be really rough and a struggle, they were more exciting to me back then than the latest tech we have today. It's like going back to standard def video after being used to 720p, 1080p and now even 4K. I guess because it was all so new to me. Using AOL was really like magic! I was also mesmerized by stuff like MS Encarta and playing back MPEG 1 video on a computer screen. There was really no on demand content back then except for movies on VHS, cassettes and CDs and of course my own recorded tapes. But to see video and play music on a computer for the first time was really special. The more we have the more we take things for granted and the less we truly appreciate all of it. Today for a couple of hundred bucks one can build a PC, use a Linux distro (more easy to setup than ever) with tons of great open source software like Audacity, VLC, Gimp, Inkscape, DOSBox, MAME, the browser of your choice, an IDE like Eclipse and have an awesome first PC great for learning and playing. Or just an iPad for $329 that can do all sorts of things. People says the millennium generation is the information generation. They know more about using modern tech than us, who are rapidly moving towards 30+. But, they also do not have the opportunity to experience the excitement we experienced. Back when I was still below 10, I played red alert after my parents leaving for an overnight shift. That was a very fun time. I knew how to play RTS and now I play Starcraft. Now we have iOS 11.4, an operating system with features people from 1980 could only dream, but in turn, the iOS is less exciting and more boring as time goes on. I use iPhone every single day, but I do not think using iOS is that exciting anymore. It’s the small things like 3D Touch cursor ties me to this system. Someone can probably open a new thread entirely for nostalgia purpose, and relive old memories from 1980s and 1990s. I will stop here for now. Just like the old times. Good’ol fashion computer. Vintage. But just good. I also start knowing more about 1980s computers and find they are indeed rough to use but also fun to use. I wonder if Apple can get out all the features that should have been launched with iOS 11 before they even announce iOS 12. I hope this fixes the USB photos syncing issues between iTunes and many iOS devices that have been plaguing people since at least September. iCloud messages will be a great feature to clean out Apple Watch messages.